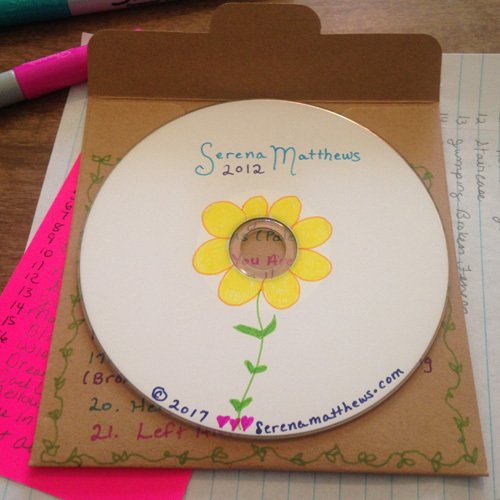 serena matthews - Would you like a CD? Would you like a CD? If you would like to buy a CD please choose from the drop-down menu.. and by the way, I thank you so much! It really means more to me than you ever coul know.. And by the way also, you are awesome to still listen to CD's! All CD's are $12.50 in the USA and $16.50 outside of the USA. If you would like to buy all 3 CD's, the price is $30 inside USA and $35 Outside of the USA. Use the PayPal Buttons at the bottom of this page to place your order. I'm also adding the option to choose the songs of your choice for $15 in the USA and $18 outside of the USA. You may select 18 songs of your choice and I'll add them to a CD and do a hand drawn cover and written track list. You can hear all of the songs on ReverbNation. Shipping is anywhere from 1-4 weeks, depending on where you live in the world and how many orders I'm working on. Since they are all done by hand, and I'm really particular about my drawings, it does take some time. Thanks so very much and I hope you enjoy the CD's! I'm testing all of them in my car CD player to be sure they work on all players. That's usually the ultimate way to test. But if for any reason you are unsatisfied with your CD, I will refund your money ASAP. If you prefer not to pay without PayPal, I do accept cash, checks, and money orders. I will send my mailing address if you need to order this way. Just let me know. Select Any 18 songs from the list above for $15 in the USA and $18 outside of the USA.